Crème Fraiche (pronounced 'krem fresh') is a cream that is naturally soured. It is thick and soft (like cream cheese) with this wonderful smooth and velvety texture. But what I really like about Crème Fraiche is its rich and tangy, almost nutty, flavor that is produced by culturing pasteurized cream with a special bacteria. (In France, where it originated, the cream is unpasteurized so it naturally contains the bacteria necessary to make creme fraiche.) You will find that every brand of commerically made Crème Fraiche tastes a little different and that is because there is no set standard for making this cream and the butterfat content does vary (although it is usually around 30%). The only problem with buying Crème Fraiche is that it's expensive and can be hard to find. At least that is the case in North America. So much so that I always make my own. It's so simple to make; just stir 1 tablespoon of buttermilk or plain yogurt, into one cup (240 ml) of heavy 'whipping' cream (35 - 40% butterfat). (You can double or triple this recipe.) Then let it sit, loosely covered with plastic wrap, at room temperature (70-75 degrees F) (21-24 degrees C) for about 24 hours. (To speed the process up just a bit, first heat the cream to lukewarm.) Your Crème Fraiche is ready when it is thick, with the consistency of mayonnaise or a thick yogurt, and has a nice 'tangy' flavor. If it still looks a little runny after 24 hours, leave it another few hours. And don't worry about the cream going bad (curdling). Regan Daly in her book 'In the Sweet Kitchen' tells us that "the benign live bacteria in the buttermilk will multiply and protect the cream from any harmful bacteria". Once the Crème Fraiche has thickened sufficiently, cover and place in the refrigerator. It will continue to thicken and take on a more tangy flavor as it ages. Crème Fraiche will keep in the refrigerator for about 7-10 days. It makes a wonderful topping (can be sweetened with honey or sugar) for fresh berries, cobblers, pies, tarts, and puddings. It can also be whipped, and when sweetened with a little sugar and vanilla, it can be used in place of whipped cream. Or you can stir a little into your savoury sauces to thicken and enrich. Place a dollop on your baked potato, on scrambled eggs, or as an accompaniment to fish or poultry. Spread on your morning toast, topped with your favorite jam. Or for a nice appetizer, flavor the creme fraiche with some finely chopped herbs and then spread on crackers or toasted bread. Top with smoked salmon or maybe some roasted vegetables. Note: The flavor of your Crème Fraiche will depend on the brand of heavy cream you use plus whether you "sour" the cream with buttermilk or plain yogurt. Personally I find that Crème Fraiche made with buttermilk has a more "tangy" flavor than Crème Fraiche made with plain yogurt. Crème Fraiche: In a medium saucepan, over low heat, warm the cream to about 105 degrees F (40 degrees C). Remove from heat, transfer the cream to a bowl, and stir in the buttermilk or plain yogurt. Let this mixture sit at room temperature (70-75 degrees F) (21-24 degrees C), loosely covered with plastic wrap, until thickened (like mayonnaise or thick yogurt) with a tangy, slightly nutty flavor. (This will take anywhere from 24 to 36 hours, depending on your room temperature.) When ready, stir the cream and then cover and place in the refrigerator until well chilled (at least 8 hours, preferably overnight). Crème fraiche can be stored in the refrigerator for up to 10 days. 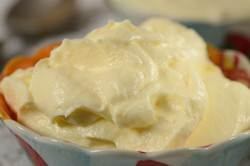 Crème Fraiche Frosting: Place your mixing bowl and whisk in the freezer for about 15-30 minutes. Then beat the Crème Fraiche with 1/2 teaspoon pure vanilla extract and 1-2 tablespoons (15-25 grams) of granulated white sugar, or to taste, until stiff peaks form. Can be used in desserts instead of whipped cream.